Every Christmas, I make a point of listening to George Frideric Handel's great oratorio, Messiah. So do many people. If you live in a large enough city, you could potentially attend a performance several times each December. And because of Messiah's lengthy performance history (and Handel's habit of modifying the score to suit his performers), the variations are endless: modern or period instruments, professional or amateur soloists, mass choirs or small ensembles—to say nothing of the extensive catalogue of recordings! A more recent tradition is the "sing-along Messiah," in which the choir invites the audience to bring their own scores and sing with them. Paradoxically, this makes the oratorio one of Western art's highest achievements, as well as one of its most accessible. Messiah is a Christmas institution. So it may come as a surprise to many that its first performance—a benefit in Dublin, Ireland, for the relief of prisoners' debt—took place in April, 1742. (The performance was a success, raising enough money to release 142 debtors from prison.) Its official debut in London took place the following March. Handel himself never had Messiah performed at Christmas; it was for the Easter season. Only the first of Messiah's three parts deals with the birth and ministry of Jesus, telling of the promise of judgment, redemption, and salvation through selected Old Testament passages as well as the birth narrative from the Gospel of Luke. Most of the best-known selections come from Part 1, likely because of its association with Christmas. The words are so closely associated with the "Hallelujah" chorus that you probably think of the music while you're reading them. We hear this chorus every Christmas, but it rightly belongs to Easter! The meaning of Messiah is not "for unto us a child is born"; it's that He is "King of kings and Lord of lords." Hallelujah! Worthy is the Lamb that was slain, and hath redeemed us to God by his blood, to receive power, andriches, and wisdom, and strength, and honour, and glory, and blessing. 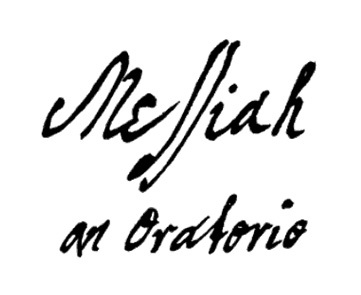 Even less commonly known, perhaps, is that Messiah is as much an apologetic work as it is an artistic one. The libretto (text) was composed by Charles Jennens, Handel's friend and frequent collaborator. Jennens was a devout Christian who was concerned about the rise in popularity of Deism amongst England's intelligentsia. Deism is a philosophical theism that rejects divine revelation as a source of knowledge, concluding that human reason alone is sufficient to establish the existence of a deity. When God created the universe, He established natural laws for its running, but He does not involve himself in its activity. Jennens' brother had lost his faith and committed suicide after corresponding with a Deist. Grieving for his brother, Jennens composed the libretto to Messiah as a response to Deism, compiling Scripture after Scripture from the King James Version of the Bible (paraphrasing here and there) to show that Christ was the promised Messiah and that God took an active interest in the redemption of the world. Jennens was reportedly less than satisfied with Handel's score (which he composed in less than a month), complaining that some parts were "far unworthy of Handel, but much more unworthy of the Messiah." The judgment of history has, perhaps, been more favourable. And the glory of the LORD shall be revealed; and all flesh shall see it together: for the mouth of the LORD hath spoken it. The last phrase is drawn out in long, solemn notes that underscore its significance. It is immediately followed by a bass solo that thunders out: "Thus saith the LORD of hosts" (Haggai 2:6). Jennens draws out the story of Jesus almost entirely from the Old Testament, primarily the prophet Isaiah, drawing from the Gospels only for the annunciation of Jesus' birth to the shepherds by the angles (Luke 2:8-14). The Creator is no mere spectator, and this birth is no mere accident of history. The mouth of the Lord has spoken it; therefore, it has come to pass. There is a strong relationship between good art and a good message. I have met many Christians who can appreciate many kinds of mediocre art as long as they mention Jesus enough times and are helpful for sharing the Gospel. Yet, in Messiah, a devout Lutheran composer has created one of the acknowledged masterpieces of the Western musical canon, listened to by millions every Christmas. Thanks to his friend, a devout Anglican with a concern for the spiritual state of England, those millions flock into auditoriums and churches willingly to hear the Gospel sung to them. I wrote last Christmas about why the Incarnation is important. Only God, taking on true humanity, could atone for the sins of, and intercede for, the human race. Without that first Christmas, when "God sent forth his son, born of a woman, born under the law" (Galatians 4:4 ESV), there would be no Easter—no cross to free us from the penalty of the law. But Charles Jennens and George Handel were right to focus on the work of Christ on the cross, and the blessings that result from it. Without the hope of Easter, there would be no joy at Christmas. Like the text of Messiah, Scripture passages are taken from the King James Version (KJV) unless otherwise indicated.